There is often a gap between words and their meaning. For instance, when we say “he is at an investment bank”, there could be many meanings: the saying may mean that he works for an investment bank, he just visited an investment bank, he was just there to wait for someone, etc. To make a conversation work, we need a condition by which we can specify the specific meaning of the saying. Grice argued that when one satisfies the rules above, one will be able to convey his or her idea using words without any confusions. 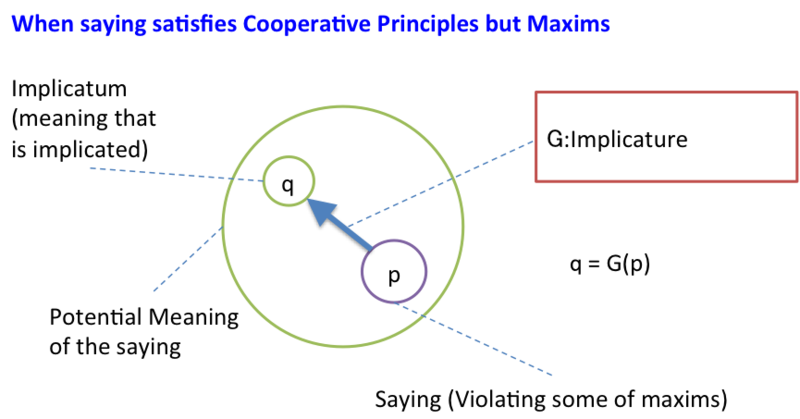 However, what we usually observe is that we are following the Cooperative Principle but maxims. In other words, although we try to cooperate for getting mutual understanding, we do not fully follow the specific rules (maxims). Even in that case, we have few issues in our communication. Why? Thus Grice came up with the theory of implicature. Implicature is his own terminology, as he believed that the word implication is close but not perfect to articulate his idea. Implicature works such that people in communication ties the saying to the appropriate meaning, through using their knowledge and information about the situation. A: I lost my key. B: I guess I saw it on the table over there. In some sense, the thought process of implicature is akin to a weak form of proof by contradiction, or a sort of abduction (see my previous post http://taejunomics.blogspot.jp/2011/12/abduction.html). According to Grice, there are two sorts of implicature. One is the conversational implicature, the implicature that is coming from conversation and thus based on the ability of people in conversation. In other words, some conversational implicatures are applicable to specific people only. “She is poor but happy”. The sentence implicates that, generally speaking, to be poor is incompatible with happiness. The difference between conventional implicature and conversational implicature is fuzzy. Most of conventional implicatures were originally conversational implicatures. The birth or transition of common sense determines the difference. The book was hard to read but quite interesting. The theory of implicature suggests that we are using very efficient conversational skill in our daily life. For example, the scope that conversational implicature covers in family conversation is especially huge, because family members have shared much time and have had common knowledge. We can shorten our family conversation because of our ability to use conversational implicature. The idea may play an important role in designing artificial intelligence. 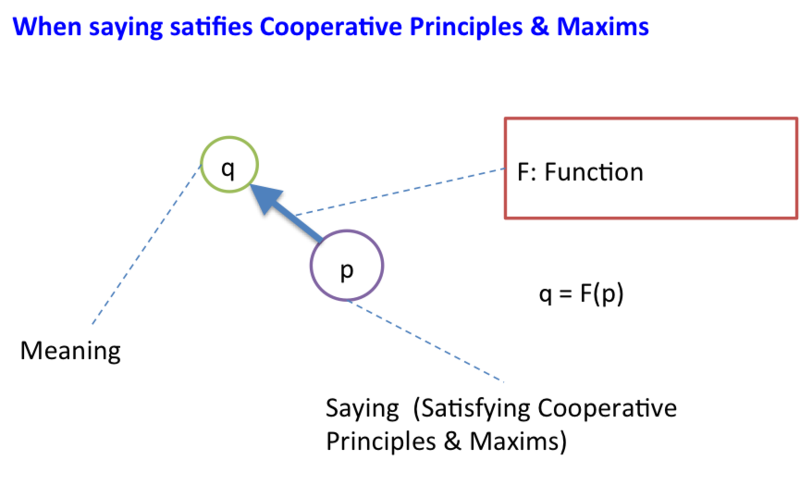 Programming machine intelligence based on implicature thinking is far difficult than doing one based on the Cooperative Principles and the associated maxims. However, as our conversational style is firmly connected to implicature, it would be vital to design the program in that way.